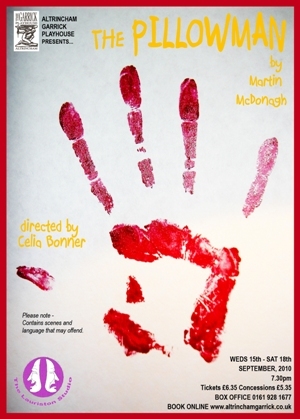 The Pillowman is a 2003 play by Irish playwright Martin McDonagh. An especially dark black comedy, it tells the tale of Katurian, a fiction writer living in a police state who is interrogated about the gruesome content of his short stories, and their similarities to a number of bizarre child murders occurring in his town. The play received the 2004 Olivier Award for Best New Play, the 2004-5 New York Drama Critics’ Circle Award for Best New Foreign Play, and two Tony Awards for production. It was nominated for the 2004 Evening Standard Award for Best New Play.